Misumena vatia is the only species in Britain belonging to the genus Misumena. As the common name suggests, it is reminiscent of a crab, with its wide, flattened body form and habit of sitting with the first two pairs of legs held apart. 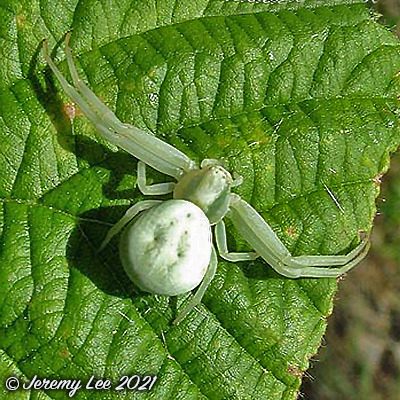 This spider has the remarkable ability to alter its colour to match its background, usually a white or yellow flower, allowing it to become beautifully camouflaged. The sexes are different in appearance; females vary in colour from white to pale green or yellow, depending on the background. They tend to have two pairs of bright red spots on the abdomen, but these may be fused to form red lines or even entirely missing. Males are much smaller in size than females and have more slender greenish white abdomens that feature brown stripes.